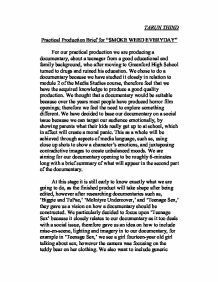 Practical Production Brief for &quot;Smoke weed everyday&quot;. 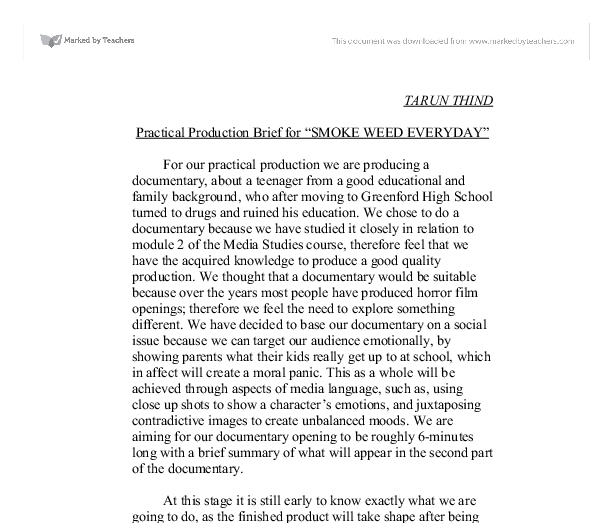 TARUN THIND Practical Production Brief for "SMOKE WEED EVERYDAY" For our practical production we are producing a documentary, about a teenager from a good educational and family background, who after moving to Greenford High School turned to drugs and ruined his education. We chose to do a documentary because we have studied it closely in relation to module 2 of the Media Studies course, therefore feel that we have the acquired knowledge to produce a good quality production. We thought that a documentary would be suitable because over the years most people have produced horror film openings; therefore we feel the need to explore something different. We have decided to base our documentary on a social issue because we can target our audience emotionally, by showing parents what their kids really get up to at school, which in affect will create a moral panic. This as a whole will be achieved through aspects of media language, such as, using close up shots to show a character's emotions, and juxtaposing contradictive images to create unbalanced moods. ...read more. We haven't planned the documentary shot by shot because we want it to be as real as possible, therefore we will film the necessary footage spontaneously, which will again give a sense of realism and conform to one of the key criteria proposed by the Direct Cinema Movement. We are hoping to follow Todorov's narrative structure. This will be done by within the whole storyline of our documentary, as in our opening we will have a boy from a good educational background as our equilibrium. The drug taking will be the disequilibrium part to it and finally he decides to give up, which will be a state of order restored. Although all three won't be shown in the opening, we intend to show the state equilibrium in the first part and the rest in the brief summary of part two of the documentary. This will work very well as it will keep our audience anxious as to two the situation will be resolved, therefore making them want to watch the second part. ...read more. Therefore by challenging this stereotype we will be showing how drugs can have a big impact on everyone. We will represent the parents in a negative way, through the eyes of the camera. This will be done by not intervening whilst the youths are smoking etc, enhancing the irresponsibility of the parents. I will be working in a group of four, in which all the responsibilities will be split, e.g. editing and filming. However Parveer will have the responsibility to bring the cameras to every shoot. We will be using two Hi-8 cameras because it will be easier to get the filming done without having to constantly change positions. We will be editing the documentary at home as we already know how to use the editing software; the software we will be using to do this will be Adobe Premiere 6.0. Adobe Premiere will help us to include many conventions that are typically associated with documentaries, such as interviews (talking heads), (male) voice over, the use of dramatic music to create a sense of tension and the use of graphics and captions. These key elements of television documentaries will give "Smoke Weed Every Day" a realistic effect. ...read more. The use of the clock motif to thread together the hunter and hunted is pure Wellesion. "The Jolson Story", another in a long list of outstanding films produced by Columbia Pictures during the 1940s, and 1950s, directed by Alfred E.
I believe all the aims that we had set out to do were met. We made people laugh (even when we did not think this would happen). One change I would have made it developed the song at the end; we could have used audience involvement to get the audience feel more involved. Character portrayal helps the audience to show the boys popularity, what they think of themselves, their self-esteem and hierarchy in the house. For example the louder boys are at the top of the pecking order, and the quieter boys are at the bottom. SECTION TWO. We began to plan the production by choosing the most popular points from the research, such as the preference for 'psychological' instead of 'Horror' sub genre of the thriller, etc. We began by writing the synopsis that would give us the basic ruling idea for the thriller. They delivered the historical context of the play through a comic and repeated chant, which broke up the emotion and tension of the monologues performed by Medea but also allowed the audience to see her humanity and the tragedy of events when shown against the comedic moments.